Modern and organic elements combine in the tree stump end tables, flowers and modern furniture. Varying textures can be found in the wood, stone, velvet fabric and plush towels. Nature enters the room through a timber alcove for the bed that creates a canopy. 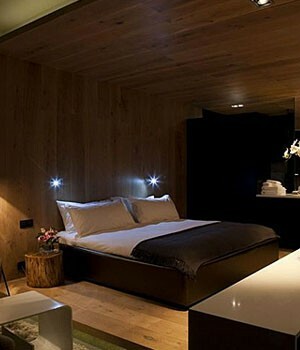 Lighting is functional and beautiful in the reading lights, recessed lighting on the bed and the modern floor lamp. The warm complimentary colors bring calm and serenity to the space.